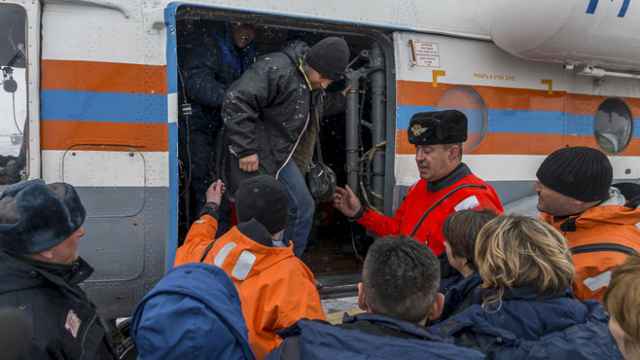 Rescued sailors from the wrecked Dalniy Vostok fishing vessel leave the Andromeda trawler at the port of Korsakov in Russia's Sakhalin region April 7, 2015. 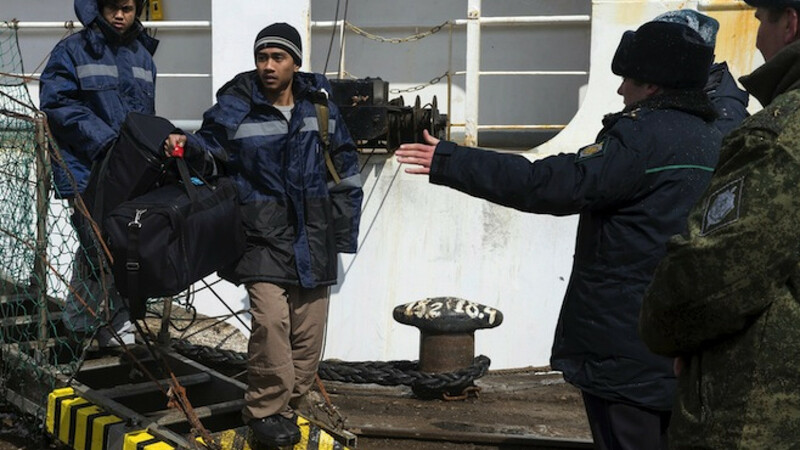 Foreign nationals who survived a shipwreck off the coast of Russia have been placed under administrative detention while investigators blamed the sinking on greed and corruption. The Dalny Vostok fishing vessel sank in the icy Sea of Okhotsk off Russia's far eastern coast last Thursday. Sixty-three people were rescued out of a crew of 132 people, with 13 missing presumed dead. Fifty-four foreign nationals were among the crew, according to a list published by the Emergency Situations Ministry — including 42 citizens of Myanmar and citizens of Vanuatu, Ukraine and Latvia. 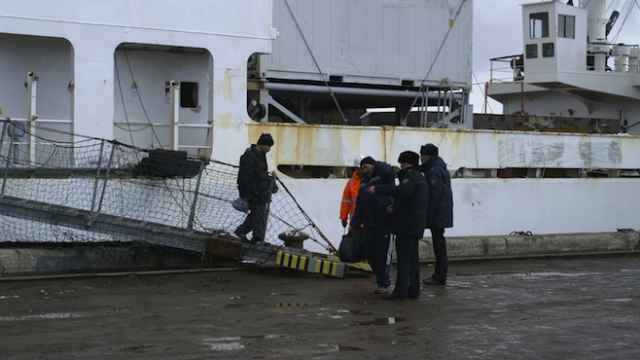 All of the foreign workers that survived the shipwreck have since been placed under administrative detention and remain supervised by police and border guards, a spokesman for the regional Federal Migration Service told the TASS news agency on Tuesday. “Our colleagues are working with the foreigners … Their identities are being established, they will be held to administrative account for illegally working on a Russian ship on the territory of the Russian Federation,” the Interfax news agency cited a source in the agency as saying Wednesday. 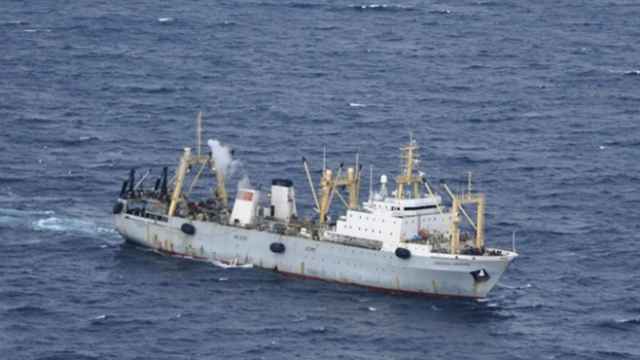 The company that owned the trawler on Tuesday denied having any knowledge of foreign nationals on board the vessel. 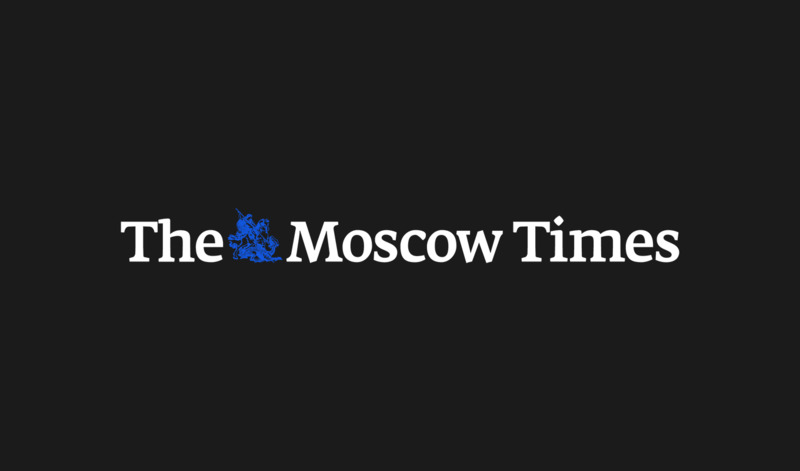 "There are no doubts that this is a crime at the base of which lies the greed of the businessmen who owned the vessel and corrupt officials," Vladimir Markin, an Investigative Committee spokesman, told Rossiya 1 television, TASS news agency reported. "Both the owner of this vessel and the captain knew that in the petrol tanks there was a minimal amount of fuel, the trawler's ability to right itself was affected." Markin also said investigators had established that there were not enough lifeboats on the Dalny Vostok for over 20 crew members. "We know that on board there were a large number of foreigners who were working there illegally. We know who brought them in and by what means," he said. "We have concrete officials (in mind), whom I won't name so they don't run away, but we will bring them to justice."